A good education in a safe, clean environment (when so many others in the world either don’t have access to an education at all or go to school at the risk of their safety). The fact that they were beginning their summer vacation & would have plenty of days to relax (another luxury we often take for granted in our “first world” country). The activity they were “complaining” about was really going to be a great experience (even if it was on their last day of school) & why they should be looking forward to it. We also talked about how easy it is to complain, especially when others are doing it, and how we shouldn’t be a part of the negativity. It’s my guess that one kid started to complain about wanting to “relax” when they got home from school & everyone jumped on board the “it’s not fair” train. Two books that came to mind (and that I highly recommend) are: Running for My Life: One Lost Boy’s Journey from the Killing Fields of Sudan to the Olympic Games by Lopez Lomong & I Am Malala: The Girl Who Stood Up for Education and Was Shot by the Taliban by Malala Yousafzai. Both of these books humbled me when I thought of all that I had been taking for granted living here in the United States & I’ve used stories from both of them to teach my kids to be more grateful. I come with a plea that we stop seeking out the storms & enjoy more fully the sunlight. I’m suggesting that we accentuate the positive. I’m asking that we look a little deeper for the good, that we still our voices of insult and sarcasm, that we more generously compliment virtue & effort…. What I am suggesting & asking is that we turn from the negativism that so permeates our society & look for the remarkable good in the land and times in which we live, that we speak of one another’s virtues more than we speak of one another’s faults, that optimism replace pessimism. How fitting this is for our society today. As adults we need to set the example. Do we accentuate the positive? Do we look for the remarkable good in our country & the times in which we live today? Or do we seek out the storms? Do we talk about what’s wrong more than what’s right? 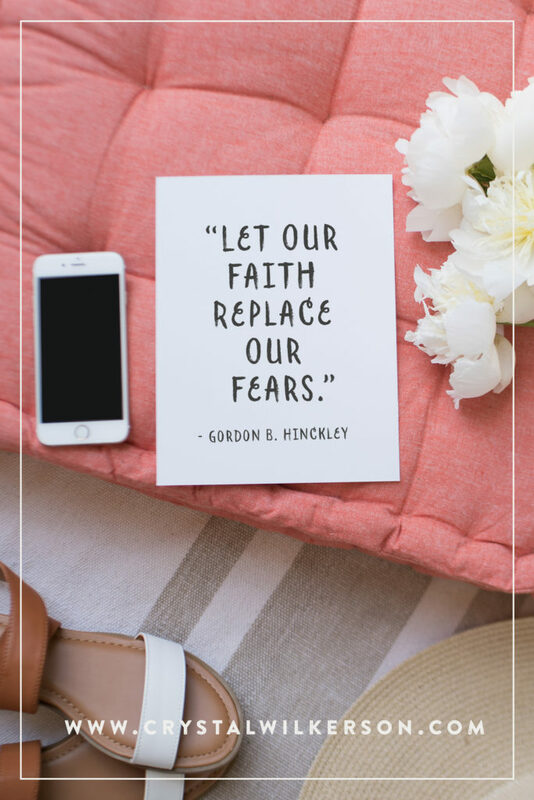 Do we let our kids see our fears more than our faith? Love this thought!! It’s been on my mind a lot lately!! I’ve become a pretty negative person. I am really trying to recognize when I’m complaining or being negative so I can try and stop and see the good. It’s hard for me. But trying! Thanks for sharing this. Hello! Love your content and style here! I have found a 30 day gratitude journal challenge that you had for sale last year. Can you make that available again soon? Hello! Can you tell me how do I go about getting your Life Planner? I REALLY REALLY need it but can’t seem to find it anywhere.